Ships Monday, April 22 if ordered in the next 1 day, 15 hours and 37 minutes! Packed with minerals, vitamins and amino Acids, experience the refreshing goodness of Goji Fruit (Lycium Barbarum) in this delicious, convenient, 100% pure, organic juice! The delicate berries of the Goji plant (Lycium Barbarum) have been treasured for centuries by the Himalayan people. These berries flourish in the tranquil valleys that are naturally protected by the Majestic Himalayan Mountains. The nutrient rich soil and the fresh mountain air guarantee nearly perfect conditions for the plant to blossom. Goji Juice, formerly a Tibetan secret, was used in ancient recipes as a delicious-tasting elixir that provided many natural benefits. Goji Gold is rich in naturally occurring minerals (Zinc, Calcium, Germanium, Selenium, Phosphorus, Copper and Iron) and many Amino Acids (Isoleucine & Methione). 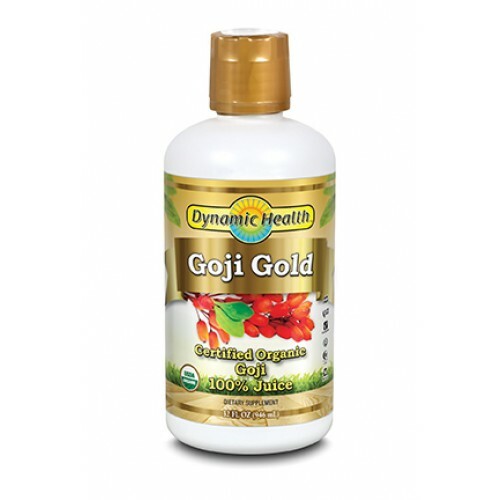 Goji Gold also provides Antioxidant Vitamins. It contains four unique Polysaccharides and Phytonutrient compounds, that work in the body as directors and carriers of the instructions that cells use to communicate with each other. These Polysaccharides are "Master Molecules" that command and control many of the body's most important defence systems and encourage good overall health. Organic Goji Juice from fresh Goji Berries. Does not contain alcohol, sugar, articifial colour or preservatives. Take 30ml (1 fl oz) daily, preferably on an empty stomach. I tried this Goji Juice because it is so nutritious and my iron levels needed a boost. I just wanted to tell you that I have never tasted anything so delicious in my life before, this juice really is "nectar"-absolutely lush! I think you should mention this fact in your description.